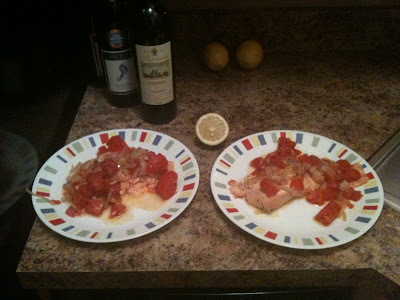 The idiot proof date night recipe (salmon baked in foil) is one of the most popular posts on the blog. So it was no surprise when my boy Eric decided to utilize its seductive qualities and prepare it for his girlfriend Alex on a recent romantic night in. Alex emailed TWSF gushing, “Eric swooned me with salmon last night! It was very tasty and here is a pic for your blog!” Atta boy Eric, hopefully she took care of dessert. Let that be evidence to all you other male readers that this recipe truly is idiot proof, not that Eric is an idiot or anything.